A still from a recently released video shows Philip Coleman, (A.B. ’96) being removed from his cell by Chicago police officer. Coleman died hours later. The city of Chicago released surveillance footage on December 7 of Chicago Police Department (CPD) employees striking a black University of Chicago graduate with a Taser and dragging him down the hallway of a Far South Side police station in 2012. Philip Coleman (A.B. ’96) died hours later from an allergic reaction to a sedative drug. The Independent Police Review Authority (IPRA), which investigates cases involving the use of force by police in Chicago, has since reopened its investigation of the incident. The release of the video adds to controversies involving the use of force surrounding the embattled CPD. In the wake of the delayed release of dashcam footage showing an officer shooting 17-year-old Laquan McDonald 16 times, the CPD and City Hall were already facing frequent protests, calls for Mayor Rahm Emanuel’s resignation, and a federal civil rights investigation. Coleman was arrested on December 12, 2012 after attacking his 69-year-old mother in her home. After being beaten by her son, Lena Coleman called his seemingly erratic behavior a mental breakdown and said she did not want to press charges. After allegedly spitting blood at an officer and a supervisor, Coleman was brought to a Far South Side police station, where a CPD officer’s alleged excessive use of force against him was captured on a video released by the city last month. The three-minute surveillance video shows five officers and a supervisor entering Coleman’s cell on the day after his arrest. After several seconds of talking to Coleman, who is sitting on his cell bed, several officers are seen physically subduing him. 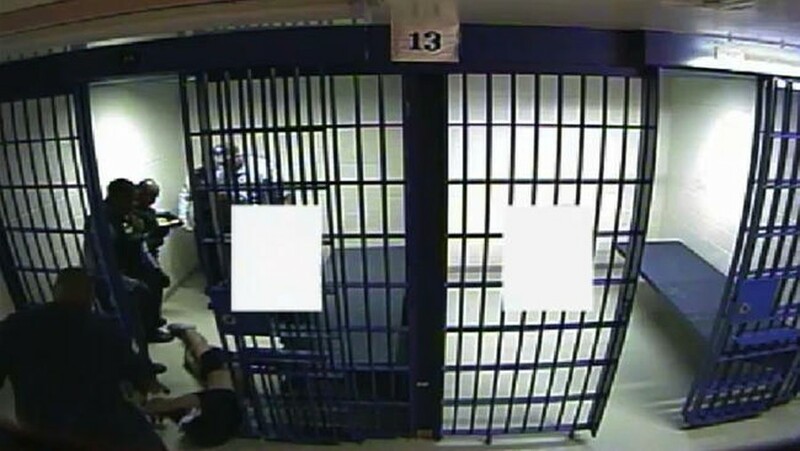 An officer then shoots Coleman several times with a Taser, and another officer drags him, handcuffed and motionless, out of his cell and through the hallway of the police station lockup. According to CPD statements, the officer shot 38-year-old Coleman with a Taser when he “became combative” toward the six CPD officers in the cell as they were attempting to transport him from the 5th District police station lockup to court. Later that day, Coleman was shot with a Taser again at Roseland Community Hospital, when he became physically aggressive toward the hospital staff, police say. Hours after being sedated with an antipsychotic drug at Roseland, Coleman was pronounced dead. The autopsy declared Coleman’s cause of death to be a reaction to the medication but also found that Coleman had more than 50 bruises and abrasions on his body, indicating severe trauma. U.S. District Justice Matthew F. Kennelly, who is presiding over the civil rights lawsuit brought forth by the Coleman family, ruled that Keith Kirkland, the civilian detention aide who was captured by surveillance cameras dragging Coleman down the hallway, violated Coleman’s civil rights by using excessive force. Kennelly also ruled that Sergeant Walker, the detention aide’s supervisor, also violated Coleman’s civil rights by failing to prevent the maltreatment. A jury will determine the monetary damages the two men will owe Coleman’s estate, Kennelly said in the ruling. IPRA initially closed its investigation of the incident, absolving the involved officers of guilt in 2014. On December 6, one day prior to the release of the video, Mayor Emanuel announced the resignation of former IPRA head Scot Ando amid heavy criticism of the agency for its closure of the Coleman case and its handling of the investigation of the November 7, 2014 killing of Laquan McDonald. Emanuel appointed Sharon Fairley, a former federal prosecutor, as IPRA’s acting chief administrator. Under new leadership, IPRA immediately reopened its investigation of the CPD’s use of force against Philip Coleman. Shannon Breymaier, a City Hall spokeswoman, said in a statement that Emanuel “eagerly” awaits the results of the IPRA’s investigation. The release of the surveillance video from the police station was accompanied with a statement from Emanuel condemning CPD’s treatment of Coleman while in custody and IPRA’s initial absolvent of the officers. Coleman’s father, Percy Coleman, told reporters in 2012 that his son did not have a history of criminal behavior.